I think you'd agree with me that your boyfriend was better during the courtship phase. Now imagine you're the Philippines. The United States is like the your boyfriend. Over the past 70 years, the boyfriend started to take you for granted. You eventually got so fed up that you unilaterally demanded for a “cool off”. The US could've just left you right then and there, but he he can't. You live right across the street to China, America's archnemesis. While the you were still dating the US, he gets to drop by your house to check on what China's doing. With the cool off, however, he can't do that anymore. And worse, China wants to be your rebound boyfriend! As soon as he caught wind of the cool-off, he started being nice to you. He stopped harassing your fishermen-neighbours, he built rehab facilities, he even promised a massive railway system! He even offers to fix your slow internet! Who are you to refuse free gifts anyway? That doesn't mean you and China are like, “together-together”. You're not that cheap. Despite China's advances, you still like the US, so you're still waiting for his next move. Unfortunately, what he managed to do so far is remind you of every miniscule thing he did for you. As if that works, right? But still, you wait. But your patience is wearing thin, and you have to take action. Will you wait forever for the US to redeem himself, or is it time to move on? Now THAT is the question. It's one thing to have a plan, but it's another thing to implement it, and what got the ball rolling was the South China Sea dispute. On 12 July 2016, the Permanent Court of Arbitration released its decision on the Philippines-China South China Sea Case, triggering an unwelcome increase in tensions between both sides [TP: Yasay's Face]. A couple of days later, to cool things down a bit, Philippine President Rodrigo Duterte announced that former President Fidel V. Ramos would "go to China to start the talks", albeit without a time frame [TSHK]. 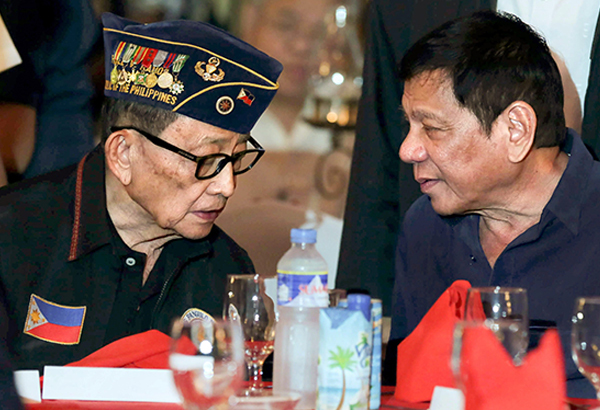 Duterte said back then, “"I have to consult many people, including president Ramos. I would like to respectfully ask him to go to China and start the talks." Ramos announced in mid-August that Beijing welcomed him to visit Beijing for diplomatic discussions. Ramos, however, told reporters that the ruling was not directly discussed and that another negotiator might take his place [AP]. This writer believes that war is not clearly not an option, as explained in a previous ThinkingPinoy article “Duterte's Philippines breaking away from the United States?”, so that peace is the only option. Duterte also explained this several times during his speeches. Duterte's choice of Ramos, I believe, was based on a mix of political gravitas and the lack of any other choices. At the time of the announcement, Duterte cannot possibly go on a state visit to China because he was still gauging how the Americans would react to the arbitral decision. Duterte couldn't have sent Vice-president Leni Robredo because she's too closely linked to former President Aquino, whose administration brought us to the brink of war, thanks to his cronies' interests in South China Sea hydrocarbons [TP: Karen Davila]. With Leni out of the picture, he had to send the next-next-best thing in terms of political clout: a former Philippine President. Cory Aquino has passed away, Joseph Estrada is a convicted plunderer [GMA], Gloria Macapagal-Arroyo is bad PR through-and-through [TP: Arroyo], while Pnoy is a moron [TP: SCS 101]. Thus, he's left with no one else but Fidel Ramos. Yes, Ramos was entangled in the PEA-Amari Scam, or what the PCIJ called “the grandmother of all scams”, but it was never proven and largely forgotten by the public, so that won't drastically affect Ramos' legitimacy in the eyes of the Filipino public. But he cancelled right when he's about to fly to Beijing, right? What happened? NOTE: We'll assume that this Manila Bulletin op-ed article, whether written by Ramos or not, actually has Ramos' imprimatur. Why? Because it's been two days and he hasn't disowned it. Ramos (or his writer, because the article uses third-person pronouns a tad too often), cited two specific issues: the Hitler Statement and the anti-American tirades. Yes, the extrajudicial killings issue is also worrisome in some respects but it does not directly affect foreign policy, and Philippine foreign policy is my focus in this piece.I think the Hitler issue, in as far as the Jews are concerned, while deplorable [TP: Dissecting Duterte] has been largely taken care of after his profuse apology to the Philippine Jewish Community [Video]. I have reason to believe that and should not be much of an issue in the long-term. I have been looking for an answer for Ramos' September cancellation announcement, and I think I got it in this piece of his. Ramos' Stance: Prudence vs Outright Aversion? That last statement regarding PH-US relations, in itself, can be easily interpreted as prudence that stems from Ramos' presidential wisdom. However, after examining the rest of the article, I discovered several easter eggs that clearly suggest where Ramos wants the country to stand. The “White Russians” when they fled from Shanghai in 1949 as the Communist Red Army was about to lay siege. Let's put this back into perspective. First, Ramos was supposed to be the envoy to China, and China is currently governed by the Communist Party, the same organization that was portrayed as oppressors in those two bullet points. Ramos is a very intelligent guy: he will not mention those two things without intending these conclusions. Second, Ramos' portrayal of the Kuomintang as being oppressed by Communist China is bad enough, but what makes this worse is the fact that the Kuomintang is actually the core of Taiwan's political history [Britannica]. And as we all know, Taiwan is China's breakaway sister. In short, Ramos basically implied that China bullies Taiwan. That's bad for a would-be diplomat. We can argue all day about what's the truth and what's not, but we're talking about Ramos, the potential diplomat. Surely, a would-be diplomat, who's supposed to be smarter than Duterte, will not publish these anti-Chinese phrases unless he really intends to offend the Chinese. In short, I think Ramos cancelled his Beijing Trip because his viewpoints do not align with the Duterte Administrations' stance. So no, he cannot be the envoy. At face value, I think Ramos' skepticism against Mainland China is understandable given his experience with China when he was still the president. Claiming storm damage in 1995, seven Chinese Navy vessels entered the area to repair "fishing shelters" in Panganiban Reef (Mischief Reef). The Ramos Government tried internationalize this issue through several means, including the call for invocation of the 1951 Mutual Defense Treaty [Dzurek 1995]. And being the inferior US ally that we have always been, the Ramos-era legislators' calls for the invocation of the 1951 Mutual Defense Treaty fell onto deaf American ears, as American Ambassador Negroponte called on both parties to settle the dispute peacefully. Yes, déjà vu. But the “déjà vu” doesn't end there. At first glance, it appears that the Philippines was bullied in 1995, only to be neglected by the United States soon after. But that isn't the entire story, because the Chinese Navy isn't stupid enough to send seven ships just to fix “fishing shelters”. A year prior to the 1995 incident, the Philippines' announced that the American company, Alcorn Petroleum, would be exploring the Kalayaan Area [Dzurek 1995], directly violating the 1992 ASEAN Declaration on the South China Sea, of which both China and the Philippines are signatories [NUS]. Thus, on the question of “Who did it first?”, it's sad to say that the answer is us, the Philippines. That's something that Filipino mainstream media failed to mention in recent memory, either because of incompetence, or because they're in the payroll of rich men with vested interests. But like I've said, there's another déjà vu. China re-occupied the Spratlys some time after 2012, right? And we all complained that China is a bully, right? What no mainstream media man tried to point out is that in 2011, Aquino's Foreign Secretary allowed Manny Pangilinan's Philex Petroleum to explore Reed Bank, which is, again, in contravention of the 1992 Declaration of Conduct [TP: Reed Bank]. We basically did in 2011 the same thing we did in 1994. Ramos basically does not believe in Duterte's Foreign Policy. That's why he wrote that piece. Ramos statement regarding US-Philippines military relations gives us a pretty good glimpse of where he stands on the US-PH-China love triangle. That is, while he wants us to make peace with China, he is unwilling to distance ourselves from the United States. Ramos' stance on China, as laid out by history and his recent Manila Bullettin article, is actually the reason why he's ineligible the country's post-arbitration chief negotiator, chiefly because “uncompromising diplomat” is an oxymoron. Moreover, wouldn't it be the irony of ironies if we let him talk to the Chinese when he basically committed the same mistake that Aquino-MVP-Del Rosario-Trillanes committed [TP: SCS Trillanes]? But most importantly, after having been jilted twice vis-a-vis the 1951 Mutual Defense Treaty, why haven't we learned yet? By the way, Ambassador Negroponte has strong links with Loida Nicolas-Lewis [TV5] and by extension, Vice-President Leni Robredo [Inq]. But let's save that story for another day.